My friend's 3-year-old daughter asked "Why are there circles there?" It had either rained the night before or frost had thawed. What explains the circles? Follow-up question: Ideally, are these really circles or some kind of superellipse? Both thawing and evaporation involve heat exchange between the stone tile, the water sitting atop the stone tile, any water that's been absorbed by the stone tile, and the air around. The basic reason that the center and the edges of the tile evaporate differently is that the gaps between the tiles change the way that heat is exchanged there. However the details of how that works are a little more involved than I can get into at the moment, and would be lost on a three-year-old anyway. A good way to explain this phenomenon to a three-year-old would be to bake a batch of brownies in a square pan, and watch how the brownies get done from the outside of the pan inwards. Even after you have finished them you can still tell the difference between the super-crispy corner brownies, the medium-crispy edge brownies, and the gooey middle-of-the-pan brownies. The three-year-old would probably ask you to repeat this explanation many times. I think the shapes are not exactly circles, superellipses, or any other simple mathematical object --- there's too much real life in the way --- but they do become more circular as the remaining puddle gets further from the edges. 2) Tiles dry out faster near the edges because initially water there partially flows away to the gaps between the tiles, as the surface of the gaps is typically somewhat lower than the surface of the tiles. EDIT (03/06/2018): @Yly and @alseether believe that this approach does not explain the difference between the water spots on the "grey and red" tiles. It does not, indeed, so I wrote earlier in a comment to rob's answer: "First of all, porosity (or some other properties) of the surface of the "grey and red" tiles can be different, but, for the sake of the argument, let us assume that they only differ in color (and, therefore, albedo). So the grey tiles can dry faster, but this mechanism can work in parallel with the porosity/runoff mechanism." The sides and corners of the cube are a few degrees warmer than the center. They are there for the same reason that an ice-cube's corners go round, and the same reason that square stones lose their corners first in the river. They aren't precisely circles, they are rounded squares also known as squircles. What would a child think of that word? You can see from the shadow that the sun has warmed the upper left sides of the squares the fastest. The water may also act as a solar reflector and reduce the surface area of the stone. Warmth from the ground may be escaping through the sides too. The rain may have gathered more deeply towards the middle of the cube too, due to runoff dynamics and capillary action. Without sunshine, the capillary action would also thin the water from the edges and the corners faster than from the center. Information for adults rather than children: solar irradiation in W/m2, Paris is 47'N and Moscow is 55'N. Others have emphasised the effects of evaporation, but I'd suggest another key factor is likely to be related to several features of the grouting that make the edges dry sooner. Firstly, the fact that the grout sits at a lower level from the top of the tile means moisture will tend to migrate to the lower level - and it will "drain" from the edges of the tile sooner than it drains from the middle of the tile. Secondly, the grouting tends to be more porous than tile, and will absorb moisture more easily and conduct it away to drier areas due to capilliary action. Thirdly, if the floor underneath is not sealed, then moisture will tend to migrate through the grout more quickly into the base and seep away, whereas the tile face is typically moisture-proof. Another possibility is that there may be slight manufacturing imperfections in the planar surface of the tile, with a slight depression in their centre, which will tend to retain moisture against all the above factors. I would suggest an alternative explanation: the tiles are not, in fact, perfectly flat. "Flat" floor tiles actually have a degree of acceptable curvature when manufactured (similar to this list of deviations) which is small enough that it's not visible, and - as you will have doubtless observed in older tiles - tend to wear more at the centre over time, making them more concave. It is likely therefore that there is a small degree of curvature to the tiles you observed. This curvature is not marked enough to be directly visible, but enough that water will pool slightly more in the centre and run down the tile towards the centre as it evaporates from the edge. While there are likely also thermodynamic differences, I think this is likely to have a bigger effect. The grout betwen the tiles is dark, and has a rougher surface than the tile. (It's composed of sand, cement, and colorings.) It's also slightly lower than the tile surface. Therefore it collects solar heat better than the lighter colored tiles, and as the heat is conducted inwards to the tile, the frost melts/water evaporates. there is less or no water on the green tiles. It seems the brownish/reddish tiles have dried slower. the perimeter of all tiles has dried faster than the centre. the filling in the perimeter of the tiles (which is also between tiles) is darker than the tiles. In fact, the further a location is from the perimeter, the less chance that it is dry. since frost was mentioned, it is probably winter or a cool time of the year. That is, the air is colder than ground temperature (ground temperature meaning at $1m$ depth and below). Darker colours absorb more wavelengths of light and heat, so they will get warmer under the same light or the same visible/near visible radiation. Some insights from this stackexchange and a good students' experiment on melting ice cubes on different colours here. 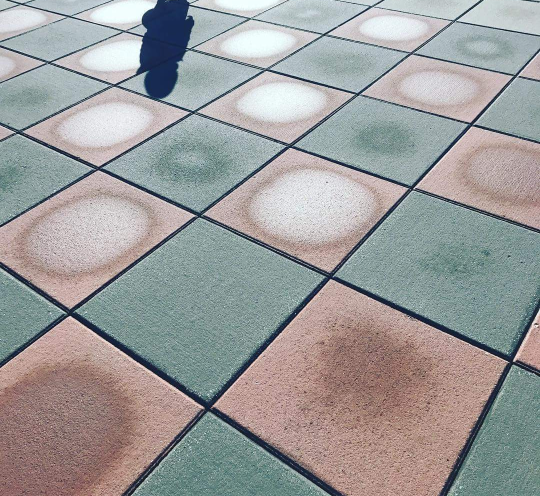 Accordingly, the green tiles are darker than the brownish reddish tiles, so they absorb more heat, making the water above them warmer, giving water molecules at the surface more energy, thus allowing them to escape in larger droves within a given time. The greener tiles thus dry faster. The water on both types of tiles is equally reflective and transparent to light, so no difference expected from that aspect. The filler material between the tiles looks darker and thus absorbs more light and heat, so that water at the perimeters evaporates more quickly. The effect of the warmer perimeter diminishes as you move away from the line of the filler material between the tiles. Whilst the effect of colour is evidently stronger here, ground heat effect is likely not neutral. The ground is a large heat sink, so that parts of buildings that are at ground level or below ground level are less affected by air temperature variation during the year, tending to be more temperature-stable. This phenomenon makes geothermal heat pumps practical alternatives to air conditioning using the refrigeration cycle. If the tiles conduct heat better than the perimeter filler material, then the ground heat effect is reducing the (surface colour-driven) contrast between the perimeter and the centre of the tiles since more heat is conducted upwards through the centre of the tiles than through the perimeter. If the filler material is a better conductor of heat however, the ground heat effect exaggerates the phenomenon of 'round' patches to some degree. In the most straight forward and basic terms..
Water that resides close to a side face of the tile (near the cracks) will exit the tile in both a horizontal and vertical fashion, thus allowing a quicker rate of drying within those regions of the tile's volume. The water in the middle, however, only leaves the tile vertically. And then, as @rob mentioned, neighboring tiles also assist in heating each other, so, there's a kind of compounding effect when considering multiple and closely adjacent tiles; or, at least, initially there is. Lastly, keep in mind that the color of the tile also plays a major role in the overall evaporation rate. As you can see, green tiles have evaporated most quickly, with red lagging behind, and this is to be expected. If these tiles weren't uniform in color, and, oriented in such an alternating fashion, you probably wouldn't have observed such circular shapes for the remaining moisture. Imagine there are three checkout lines at a grocery store (left, middle, right). Each line has the same number of people initially. For the middle line, customers can only check out using the counter that exists in the very front of the line. For the left and right lines though, with each step forward, people will also be able to use checkout counters that exist along the sides of the check out lines, and not just at the front. Depending on the number of checkout counters that exist along the sides of each line, the left and right lines will diminish that much quicker than the middle line, eventually leaving just the middle checkout line. This could very easily be demonstrated with a small group of people, or, a handful of toys / action figures. Have you checked whether the tiles are really completely flat? The easiest explanation would be that in the middle of the tiles the water is a little deeper than at the outside and that the water evaporation starting in the shallower outside parts causes these quasi-circular water puddles. You could easily test this by pouring some water on a dry tile and then see whether a puddle forms in the middle. Not the answer you're looking for? Browse other questions tagged thermodynamics everyday-life geometry evaporation or ask your own question. Black and white matters. But why and how? Why is paper more frangible when it is wet? Why is it hard to breathe when cycling against the wind? Are these sunglass lenses linearly polarized or what? Why do canvas water bags and doors expanded when wet? What are circles on broth (eating soup) surface? What are the conditions for a clean night sky? With plenty stars? What is an experiment to teach my daughter about steam (water) pressure? Does a circle become bigger or smaller when rotating?